There is nothing ordinary about the Nissan Juke NISMO. Take one part SUV and another part rally car and what you have are the makings of a highly unusual vehicle. About as unusual as the Nissan Cube, but one that provides a far superior driving experience than its quadrate platform mate. A two-day, 600-mile jaunt through the southern Appalachian Mountain range personally revealed much about the 2013 Nissan Juke NISMO, while also winning over the heart of this once skeptical driver. NISMO is new to the Nissan Juke for 2013. It is about a 60-mile jaunt from Boone, NC to Erwin, Tenn., with Grandfather Mountain an ideal place to stop when traversing the southern Appalachian range. Grandfather Mountain at 5,946 feet is not the largest mountain in the Blue Ridge Mountain range. There are about 40 others that come in taller, with Mount Mitchell cresting at 6,684 feet, the tallest mountain east of the Mississippi River. Grandfather, however, is easily accessible with a narrow, twisting road taking you to a parking spot nearest the Swinging Bridge. That’s perfect for putting the Nissan Juke NISMO through the paces although, with tourist traffic in abundance, that portion of the trip won’t satisfy your need for speed. It will, however, demonstrate that summer tires plus a six-speed manual transmission paired with a turbocharged four-cylinder engine are a winning combination. Did I mention that this front-wheel-drive model has a sport-tuned suspension? Shifting comes easy with the NISMO’s manual transmission, with the first and second gears aiding in moving this diminutive SUV precisely and quickly. I personally prefer a stick, especially for wide open driving. However, around town — especially in Boone — manual shifters can require much work, especially when tagging a tourist who thinks that the posted 20 mph signs are the law, not a suggestion. Grandfather Mountain’s unique flora (Blue Ridge Goldenrod), crisp and cooler air and treasured fauna (northern saw-whet owl) are not to be missed. Sweeping views of the valley below from the Swinging Bridge have you appreciating the divine handiwork and what it took to assemble what only recently became a North Carolina state park. Heading back down the mountain meant engaging a handful of hairpin turns with steep drop-offs causing already sweaty palms to grip the steering wheel a wee bit tighter. That experience, however, was tempered by the usual parade of tourists gawking at the magnificent rock formations that abutted the road. Most were standing off the road; others stood right on it. Oh, to take to this road when the park is closed is a thought one can only dream about. My younger son and I were alone on the journey, a special father-son outing that took him to an area of two states he had not seen before. Taking in rolling hills is usually the extent of his experience with those hills gradually easing on trips east toward the ocean. Heading west meant taking in a more pronounced topography, especially when leaving Grandfather Mountain on the way to Tennessee. 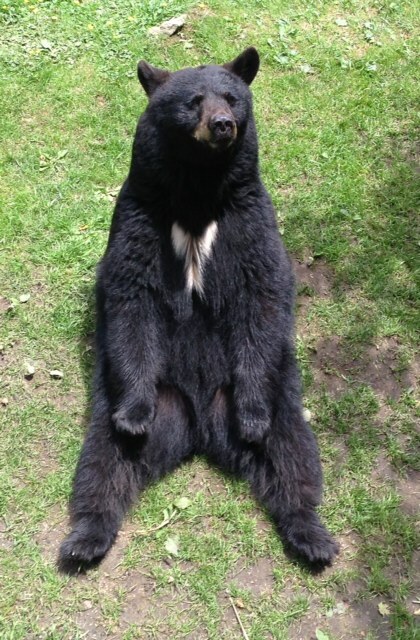 A satisfied resident of the Grandfather Mountain Zoo. NISMO stands for Nissan Motorsport International Limited, the people that brought us the Nissan Skyline GT-R. They also developed the 370Z NISMO and will soon be bringing a GT-R NISMO to the world. NISMO is best known in the motorsports kingdom for race cars and off-road trucks that are outfitted with world-class suspensions and powered by robust engines mated to capable transmissions. There is even a NIssan LEAF NISMO RC, an electric-powered race car that whispers instead of roars. EPA: 25 mpg city, 31 mpg hwy. The Nissan Juke Nismo adds nine horsepower to the standard 188 horsepower offered elsewhere and $4,000 to the base Juke sticker price. That higher price swaps out a continuously variable transmission for the six-speed manual, and delivers 184 foot-pounds of torque. Larger wheels, a NISMO-tuned suspension and steering, plus an aerodynamic body kit are part of the upgrade. The test model came with a navigation package which included a rearview camera, NavTraffic, a six-speaker Rockford Fosgate audio system with amplifier and subwoofer, and a USB connection port. The exterior upgrades included aluminum-alloy wheels, 18-inch Continental ContiSport Contact 225/45R 18 Y XL summer tires, smoked headlights, LED daytime running lights, red side mirror cladding, body-color fender lip moldings, a rear roof spoiler along with NISMO detailing across the grille and on the chrome exhaust. 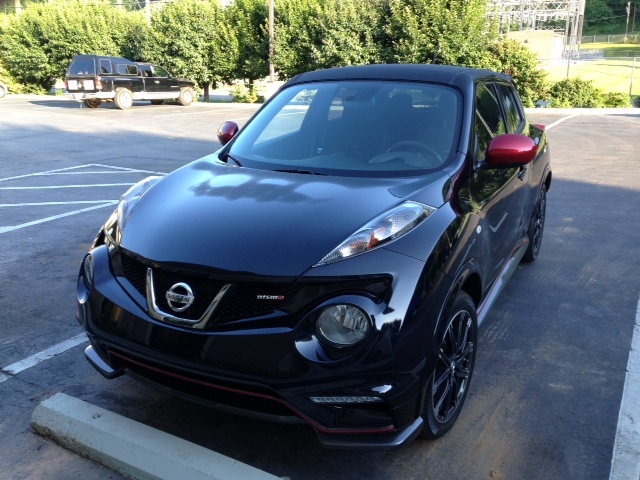 Inside, the Juke Nismo is outfitted with deeply bolstered imitation suede front bucket seats. Its tachometer and speedometer dials flank a digital readout that displays miles to empty and odometer readings. Take note of the tachometer: it may appear black at first glance, but when the cabin fills with natural light, it turns a brilliant red. A five-inch touchscreen display operates infotainment and navigation, with plenty of switches nearby to play with instead. That the Nissan Juke has a back seat seems more like an afterthought. There are three seat belt placements, but this model would have best been served with a two-place seating arrangement or perhaps forgotten entirely. Notably, leg room is restricted and the existing back seat has difficulty folding down unless both front seats are pulled at least part of the way forward. The Nissan Juke is not a family car despite its four doors — you’d be satisfied with this model if performance and two available seats are your winning combination. 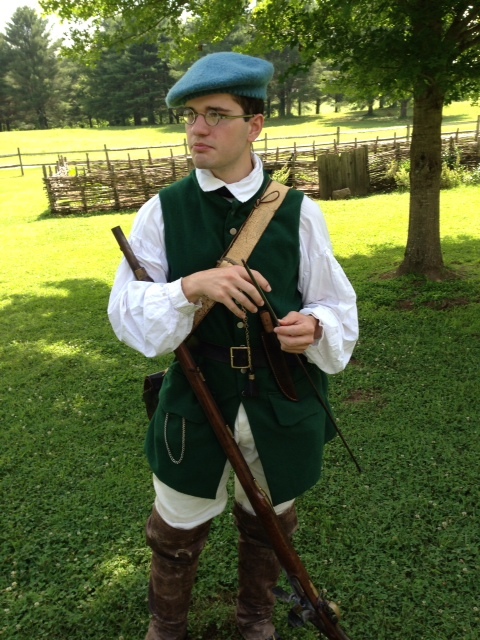 Joseph Gamble, a historical interpreter at Davy Crockett Birthplace State Park, prepares to fire his musket. “If you head over to the cabin, our guide will open it up for you. He may even fire his musket,” said the kindly docent at the Davy Crockett Birthplace State Park in Limestone, Tenn. We had arrived at the park an hour and one-half earlier only to find that the visitor center opening time had been pushed back from 8 a.m. to 10 a.m. The furthest out leg of our journey had us driving through mostly farmland, an area dotted with an old country store, a majestic red barn and not a few narrow, twisty roads. Those roads gave us the chance to once again test the Juke Nismo’s suspension system, a sport-tuned arrangement with increased spring and dampening rates. The Juke Nismo is also outfitted with speed-sensitive electric power steering, features that handled even the most challenging curves with ease. One day earlier we found ourselves headed southwest on US 221, passing along and over sparkling rivers on a looping road that crossed the Tennessee border. Once we were in the Volunteer State, we took county and state roads past Roan Mountain and pushed nearly due west before we picked up I-26 and headed southwest to our overnight stop at Erwin. The mountain roads presented just the kind of drive that enthusiasts want with enough “slow passing lanes” in place to zip by slower moving traffic whose drivers had the good sense to stay to the right. Fifth gear became the default gear of choice for much of the high terrain portions of our trip at speeds of around 50 mph were maintained. The summer tires gripped the dry roads with ease, imbuing this driver with the confidence to put the Nissan Juke Nismo through its paces. The musket fired and moments later we jumped in the Juke Nismo for our five-hour journey home. It was a whirlwind trip, something we wouldn’t have enjoyed nearly as much had we been riding in a more sedate model. But, we were riding in the Nissan Juke Nismo and tracing our way back along the same roads that had delighted us just a day earlier.